Midwestern Gothic – A Literary Journal » Blog Archive » Summer 2018 issue is here! Summer 2018 issue is here! 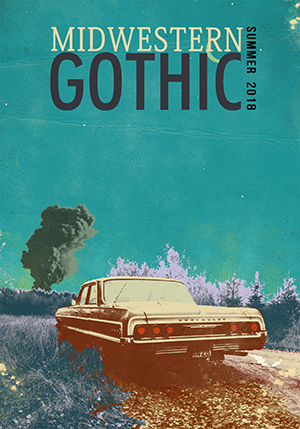 School may be starting soon, but we’re still clinging to the memory of summer, and you can too: the Summer 2018 issue of Midwestern Gothic is here! With cover art by the uber-talented Chris Bigalke, we’re thrilled with how this issue turned out! Check out the Summer 2018 issue with fiction from Marc Allen, Gail Aronson, Nathaniel Blaesing, Eimile Campbell, Michael Cebula, Scott Dorsch, Jen Ippensen, Laurence Levy, Sophie Paquette, Scott Onak, Jeremy John Parker, Chloe Seim, Aurore Sibley, and Alyssa Striplin. Plus poetry from Erica Anderson-Senter, Nancy Botkin, Kai Carlson-Wee, Sanda Moore Coleman, Nicole Connolly, Savannah Cooper, Brian Czyzyk, Carthryn Essinger, Lara Frankena, Rae Hoffman Jager, Michael Kriesel, Gerry LaFemina, John LaPine, Lizzy Petersen, Samuel Piccone, Joseph Pritchard, Sara Ryan, and Josh Weston. And nonfiction from Stephanie Anderson, Laura Dorwart, Stacy Boe Miller, Claire Moran, Cassandra Morrison, and Elisabeth Giffin Speckman. You’ll also find photography by Steve Frosch, Alec Josaitis, David McCleery, and Kevin Yuskis. Shop now for the Summer 2018 issue of Midwestern Gothic. As a reminder, the Summer 2018 issue will be our last issue before we go on a temporary hiatus, so this is an issue you won’t want to miss! Summer 2017 issue is here!